Modwheel are a small New Zealand-based company set up by composers Steve Roche and David Donaldson as a way of marketing their quirky Kontakt instrument designs. The creation of their latest instrument didn’t involve any actual garroting, as far as I’m aware, but a strained wire was definitely used. A video can be found on the Modwheel web site showing Steve and David attaching a piano wire to the wall of a room and stretching it across a triangular wooden bridge. Eventually the bridge gets fixed to a soundbox and the whole apparatus is fine-tuned using a turnbuckle. Sadly the actual sampling process isn’t shown in the film, but the product’s release notes explain that the wire was picked, struck with a mallet, played with a bow and “generally tortured”, whatever that means! 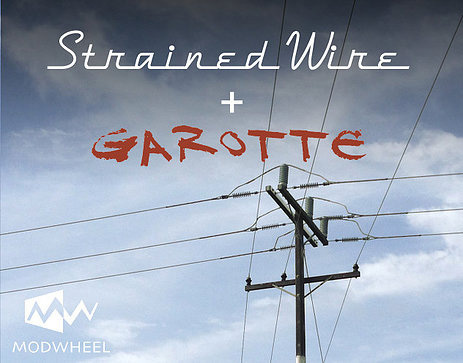 Like Modwheel’s previous products, Strained Wire & Garotte provides multiple Kontakt interfaces (rather a single master interface with menu options), and these are divided between three folders. The first folder is called Bowed-Plucked-Mallet and contains 18 interfaces. Within the interface each of the 18 samples are arranged in a chromatic scale and spread over either four or six octaves. As an alternative to piano wire, tennis racket wire (referred to as ‘gut’) and grass strimmer wire (known as ‘red line’) were used to create the samples for some of the interfaces, generally resulting in a softer and more synth-like sound. A number of the interfaces also include a 32-step arpeggiator, but most just have a simple ‘Front Panel’ page with three controls and an effects page featuring a minimally equipped (but nice sounding) amp, rotary effect, echo/delay and phaser. The first control on the Front Panel page sets the attack of the sample patch using a value range of 1 to 99. Next along is reverb level with a similar value range, and lastly there’s a control for altering the speed of a tremolo effect. In most cases, the tremolo’s depth is mapped to the mod wheel, which works quite well as a performance feature. The next folder, called Garotte, contains just six interfaces, all of which feature the same Front Panel controls and effects options as before. Generally speaking, these patches are a little more experimental and could be quite useful for sinister horror score work. Different sounds appear on different keys (there isn’t a chormatic scale as such) and there are four octaves of samples per interface, so quite a lot fun is to be had with each one. The last folder is Wilberforce Atmos, which holds 27 Kontakt interfaces. The controls and effects are the same as those of the Bowed-Plucked-Mallet interfaces, but this time the samples were made with just the piano-wire setup and are intended for use when creating cinematic soundscapes. They feature drones, impacts and textures. As a whole, the library’s sounds are very playable and surprisingly diverse given the simplicity of the source instrument. For example, some of the piano-wire instruments are zither-like; the bowed ones sound like cellos, while the gut and red-line mallet interfaces could be used as a source of synth bass sounds for dance tracks. 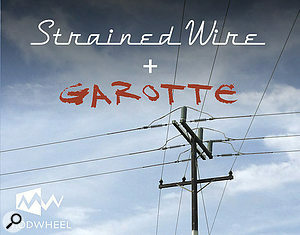 Ultimately, Strained Wire & Garotte is a set of very simple Kontakt instruments that are extremely easy to understand and play. There is practically no learning curve at all, and therefore no excuses can be made for failing to concentrate on the processes of manipulating sounds and making performances. If only that could be said about every sample library!